The Scratching Post – 2014 Issue No. 1 – Tails High, Inc. Please enjoy this edition of the Tails High newsletter. We can always use help creating more content so please email Beth if you can volunteer to write an article. A big thank you goes out to all of our supporters who made a donation during our Winter fundraiser. Your kindness will help us continue our mission–and maybe buy a couple of extra furry mice in the process! Tails High is a listed charity with the Combined Federal Campaign. Our CFC number is 23910 and using this number federal employees can allocate a part of their CFC contribution to Tails High which will enable us to rescue more homeless cats and kittens. Click Donate Now at http://www.cfcnca.org to make a CFC contribution by the deadline (January 15, 2014). Donate by shopping through Adopt-A-Shelter.com. It doesn’t cost you any extra and the online stores where you shop will donate a percentage of your purchase back to Tails High. You can select from a massive list of participating stores which includes Amazon, Best Buy, Target, and Walmart. Become a Sustaining Donor. Please consider donating enough money each month to cover the cost of one of our expenses. The bottom left corner of our website contains a link where you can sign up (using PayPal) to regularly provide some of the supplies we need like food, litter, vaccines, and spay/neuter. Every donation counts, no matter the amount. Donate via PayPal or send a check to: Tails High, Inc., 708 Timber Branch Drive, Alexandria, VA 22302. We also have a donation box at our adoption events if you’d rather stop by and see us. Our organization is 100% volunteer based, so you can rest assured knowing that every dollar you give will go directly to the care and well-being of our foster kitties. In the last few months, Tails High has had some expensive medical situations resulting in large medical bills and a smaller bank account balance. While saving a life by treating these kitties is always worth the cost, we do not receive any county, state or public funding. We rely solely on compassionate people like you to helpus care for our rescued cats and kittens. Tails High would like to take advantage of a variety of grants and contests in 2014 to help us raise funds. In order to do this, we need some volunteers to help us find and apply for these opportunities. If you have the time and writing skills to help us out, please email Tails High. More than one person can help with this task. Our good friend and volunteer Alison Freese has moved on from her time with Tails High. She recently relocated to Portland, Oregon. Alison has been taking beautiful photographs of our kitties since last Spring and we quickly realized her potential and her dedication to animals, not to mention her incredible photographs. Alison took an average of 125 photos at each adoption event. They say a good photograph dramatically increases a cat’s chance of being adopted and we learned that Alison’s ability to capture the personality of our kitties in her photographs helped more than 50 cats and kittens find new homes quickly. Alison first met Tails High volunteers at an old town Alexandria adoption event and started by taking photos of the cats at a Tails High foster home. She started visiting other foster homes on request and this past summer Alison began taking photos at the Annandale Petco adoption events. That’s when things got really exciting. Alison tried setting up makeshift backdrops and props and had to experiment with the lighting conditions in the store, but she was determined to do the best she could to help find homes for all the Tails High cats. Annandale events can be very chaotic and busy, with a lot of volunteers and potential adopters but amazingly most of the cats would settle into the comfy bed in Alison’s tiny makeshift “studio,” giving her the opportunity to capture their dignity and beauty. Once they calmed down, the cats would often look straight into the camera and wait for Alison to click the shutter or they would turn, it seemed, to show her their best profile. Some kitties got a little too relaxed and Alison would have to gently remove them to make room for the next subject. Alison would watch our website like a hawk and always felt incredibly gratified when she saw the status on our kitties change to “checking out a new home” or “Adopted”. There are no words to describe how much Alison will be missed – and not just for her lovely photographs. She is truly a champion for the animals. We appreciate her creativity, patience, and passion, but we also love her for her ability to get things done and her cheerful attitude. She never complained about the chaos of our adoption events and she produced the highest quality work. Tails High would like to say thank you to Alison from the bottom of our hearts and we wish you well in Oregon! Q. How should I introduce my new cat to the cat already in my home? A. It’s a good idea to start your new cat out in a small area like a bathroom until the cat is comfortable with his or her new surroundings. Then, wait for the new cat to acclimate to the small area you’ve chosen before making introductions to other cats. Before cats see each other, they will smell each other. There are glands at the corners of cats’ mouths that secrete a scent that’s used for communication and territory marking. Try swapping the cats’ beds so they can each experience the other’s scent and you also can rub a clean sock or washcloth against the side of each cat’s cheeks to fill it with scent, and then let each cat smell the other’s cloth. Your resident cat may feel threatened or displaced by the new cat’s presence at first and may need time to become accustomed to the idea of a new pet in the house. Don’t be surprised or alarmed if you hear growling and hissing at the door to the room where your new cat is initially staying. It may take several days for the hissing or growling to subside. The process may seem painfully slow for humans, but for successful integration, it’s important to stretch out the introduction to a pace comfortable for the cats. In the next few days, try placing the new cat in its carrier and bringing it into your main living area. Give both cats some treats or food so that they associate each other’s presence with a pleasurable experience. Once the cats are comfortable in this situation, allow them interact under your supervision. Make sure to give each cat an escape route, and don’t worry if initial interactions last only a few seconds or minutes. Gradually increase the time the cats spend together, as long as they are not aggressive toward each other. Jade and Journey were both adopted from Tails High by Claire, one of our volunteers. Jade is a 3 year old brown tabby with the greenest eyes ever (hence her name). Her forever family calls her JADYKINS for fun. She was just a year old when she was adopted and always seemed to be a loner at the Tails High adoption events. She is one of our many stories where her foster fell in love and adopted her. Jade took over the house in just a matter of days, being sassy to Claire’s existing and shy older cat Pookie. While Jade took her place at the top of the cat chain, she seemed terrified of the dog at first. It didn’t take long though for Jade to teach the dog that she was to be respected. Two and a half years later, she sleeps right next to the dog, and we expect the two will be ‘besties’ forever. Journey is approximately 7 years old and he came to Tails High as a drop off at the shelter. Journey was the gentle moose hanging around the others, never lifting a paw to the rambunctious kittens and knowing when to stay away from the more nervous cats. Unfortunately, Journey did not show very well at adoption events and a couple times even bit people when they came at him from the front to give him a head scratch. It must have had some history that he just couldn’t let go of but Journey’s forever home has figured it out that he actually loves head scratches as long as you start from the side. Now he walks up to you and begs for scratches! The three felines in the house (Pookie, Jade & Journey) all hang out together now and it just goes to show that whether it’s a new kitten or an old cat, Tails High has the cat (or cats) for you! 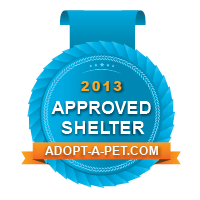 When you shop online by entering sites through adoptashelter.com or their link on our web site, you earn money for Tails High and it doesn’t cost you anything.